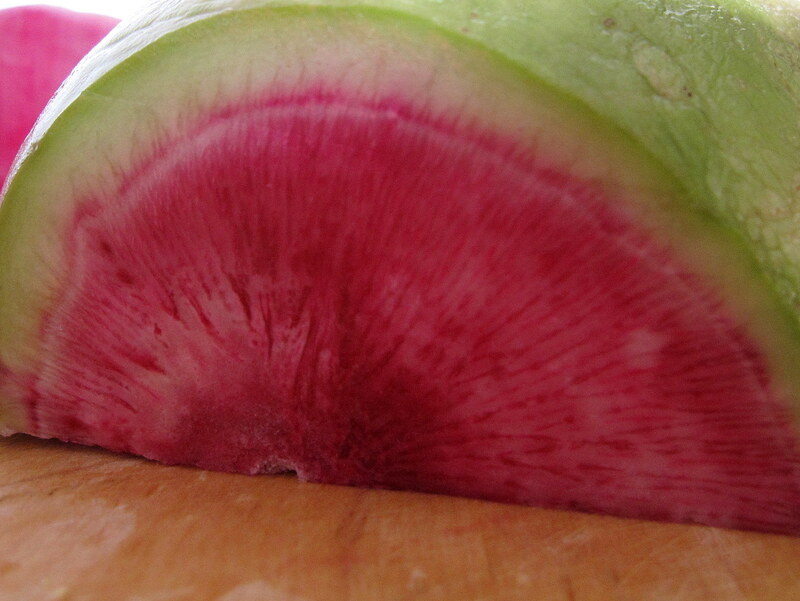 It doesn’t look like much from the outside, but once you cut it open and see its brilliant pink, you’ll know why another name for this radish is Beauty Heart Radish. I first encountered it when I was living in China. One day it appeared in a lettuce and carrot salad when I was eating at a neighborhood restaurant with fellow teachers. Immediately I fell in love with its color, its crunchy texture and its subtle radish flavor. Later I had it in another salad where it was the star of the dish. When I saw one of these radishes for sale at our local co-op, I knew that I had to try and re-create the salad I enjoyed many times when I was living in China. Using a peeler, remove the tough light green skin. 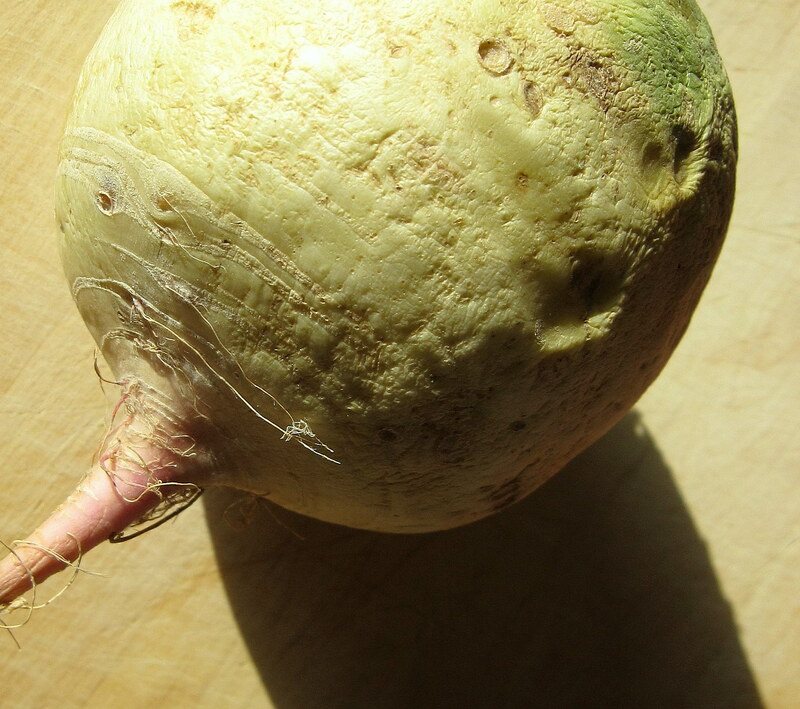 It’s okay if there’s some white “rind” left on the radish. Cut the radish into small pieces and toss with a dash of salt in a bowl. Set aside. Dice the green onions. If you have peanuts in their shells, crack them open and remove the thin papery covering. 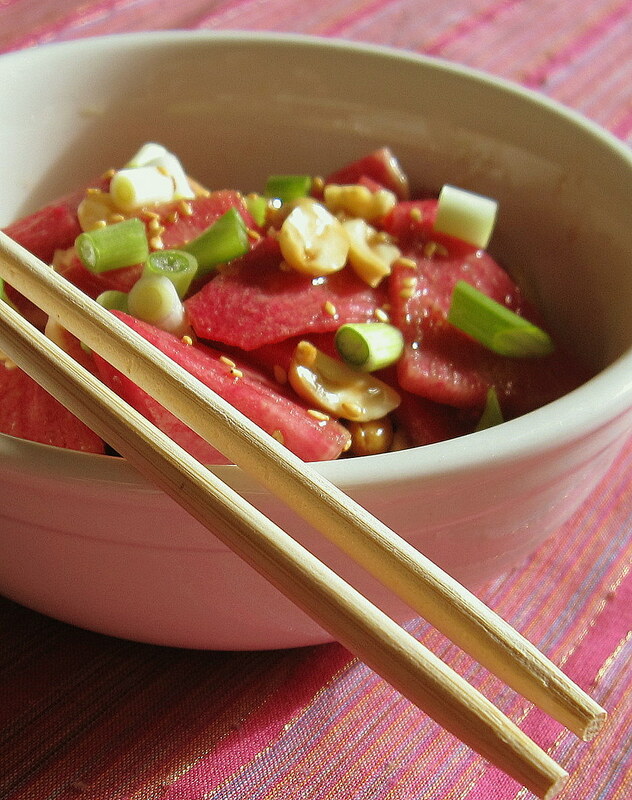 Pour the sauce over the radish slices and toss together with peanuts and diced green onions. Top with toasted sesame seeds for extra crunch. This salad is served cold. It would be a great accompaniment to a stir fry. Or if you’re like me, you can just eat it will a big bowl of steamed rice. Have you ever tried other types of radishes? Would you be willing to put a little summer in your winter?